The company is continuing to spread its wings, today announcing plans to set up shop in Singapore and kick off test flights next year. Voloctoper's pilotless electric aircraft is built to take two passengers on short automated flights within urban centers. The idea is that one day folks will turn up to dedicated skyport stations, climb aboard and punch their destination into a tablet to have the flight control software fly them up and over the congested streets below. Volocopter says its aircraft can cover just under 30 km (18.6 mi) on each charge, and that it is quiet enough at altitudes of 100 m (330 ft) to not be heard from ground level. The move into Singapore involves establishing a local product design and engineering team, and working with local real-estate developers and mobility firms to usher in the era of flying taxis. 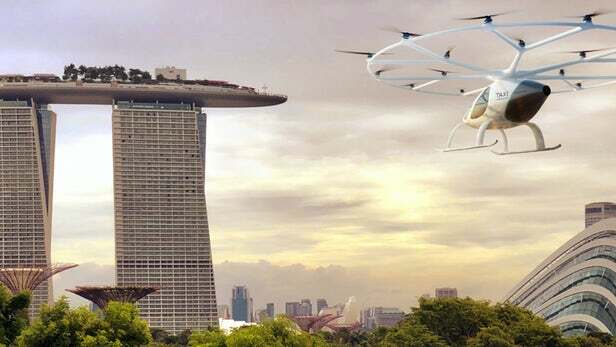 It says test flights are scheduled for the second half of 2019, and will be designed to verify Volocopter's suitability for Singapore's urban environment.